I am a neuroscientist at UCL’s Institute of Cognitive Neuroscience, heading the Plasticity Lab. My main interest is in understanding the key drivers and limitations of reorganisation in the adult brain. 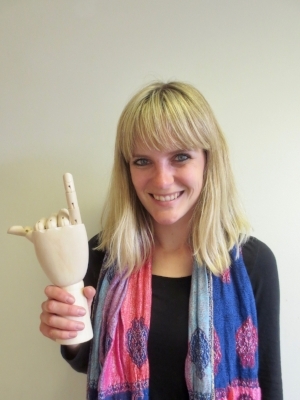 My primary model for this work is studying individuals with a hand loss. A particular focus is on how habitual behaviour, such as prosthesis usage, shapes brain reorganisation. For this purpose, I integrate methods from the fields of neuroscience, experimental psychology and rehabilitation. I hope my research will enable clinicians to guide amputees and related clinical populations to take advantage of the benefits of brain reorganisation, rather than to suffer from their adverse effects. I am a postdoctoral researcher, with a biology background. I did my PhD and a first postdoc on tactile perception and brain plasticity. I am interested in understanding how the usage we do of our different body parts (i.e., both in terms of movement and touch) affects brain organisation in adults. Specifically, I investigate how the loss or absence of a hand (i.e., in amputees) modifies the way the other body parts are used in daily activities, and how this modified behaviour impacts brain organisation. To this aim, I combine different methods, from psychophysics to neuroimaging, but also brain stimulation. I’m a PhD student in Clinical Neuroscience at the University of Oxford. I'm interested in integrating tools from different disciplines (cognitive psychology, neuroimaging, rehabilitation, computational neuroscience), in order to gain a better understanding of brain plasticity, to benefit real people with real life problems. Specifically, I'm focusing on the issue of low prosthesis usage in individuals with congenital and acquired limb loss. I'm a tech enthusiast and an all-round geek. I am a PhD student in Cognitive Neuroscience at UCL with a background in biomedical engineering. I am interested in combining the strengths of technology and neuroscientific research to best help individuals suffering from motor deficits. In particular, I explore opportunities for improving the usability and design of artificial limbs. In my research, I am looking at the supernumerary robotic fingers as an alternative to traditional prosthetic devices. I study the changes in the sensorimotor systems associated with the usage of an extra fingers both in healthy participants and in amputees. I’m a PhD student in Clinical Neuroscience at the University of Oxford. I am interested in the possible mechanisms behind the experience of phantom pain in acquired amputees. Specifically, I will be using an fMRI probability paradigm in combination with a predictive coding framework, to attempt to explain the chronicity of this condition. I am also interested in the reciprocity of the relationship between the primary sensorimotor cortices, and whether this can provide adaptive benefits to individuals. I’m a PhD student with the UCL/NIMH joint doctoral program. I am interested in how the brain changes to meet the cognitive and motor demands of wearable robotic devices. 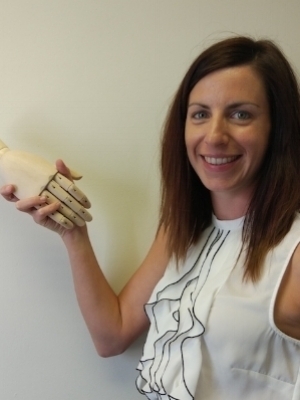 My current research focuses on how the brain facilitates congenital and acquired upper-limb amputees to control an artificial prosthetic hand. Using a combination of fMRI and motor paradigms, I hope to better understand how amputees learn to control prosthetic hands to inform the design of prosthetic devices and prosthesis training protocols. I am a PhD student in Cognitive Neuroscience at UCL, with a background in experimental psychology. I am interested in the role of adaptive behavioural strategies, which individuals develop to compensate for the missing hand, in driving cortical reorganisation. I will use fMRI and TMS to assess cortical reorganisation and its causality with adaptive behaviour. To examine compensatory strategies and their behavioural effects, I combine ecological tasks with psychophysical measures in individuals with congenital and acquired upper-limb loss. I am a Research Assistant and Product Designer in Cognitive Neuroscience at UCL. My background is in prosthetic arm design and human extension exploration, and I’m interested in forming strong connections between design and neuroscience. My Masters degree project - the Third Thumb (https://vimeo.com/220291411), is a 3D printed supernumerary robotic thumb, which is currently the main tool for a fMRI study on how the brain adapts to the usage of devices that augment the capabilities of the human hand. I am an MRC PhD student, doing a 3 month rotation in the Plasticity Lab. My background is in Neuroscience and Rehabilitation Engineering, and I am interested in the combination of the two. More specifically, I am interested in how we can use interventions to enhance plasticity within the brain. As part of my research with the Plasticity Lab, I am looking at the neurological changes that occur following use of a supernumerary robotic finger. I’m a MSc student in the Dual MSc in Brain and Mind Sciences at the Institute of Neurology (UCL). I am excited to be working on an fMRI project investigating how compensatory everyday behaviours in individuals who have either lost an upper-limb during their lifetime or were born without one impact functional cortical reorganisation. The outcome will hopefully shed some more light on the process of brain reorganisation, which I believe is vital for a better implementation of prosthetics in amputees but also of treatments in the wider population of neurological patients. I am studying for an Integrated Master’s in Neuroscience at UCL. My research interests lie in how human augmentation with robotic limbs could improve our lives in the future. Currently I am training participants to use a robotic thumb, to determine the extent to which improved motor control correlates with hand-robot integration and altered hand representation. I’m a MSc student in Neuroscience at UCL. I am interested in understanding how the somatosensory and the motor systems interact. In my research, I assess whether a period of tactile training can subsequently enhance motor abilities. Beyond gaining a better understanding of the reciprocal relationship between the sensorimotor systems, I hope my research will aid future developments of tactile feedback in prosthetic limbs. I’m a MSc student in Brain and Mind sciences at UCL. I am mainly interested in sensorimotor plasticity, and how it can be investigated in healthy individuals to improve clinical interventions in amputees. Specifically, I’ll be exploring the possibility of inducing plasticity in the motor cortex by training individuals with perceptual tasks. I am an undergraduate medical student at UCL currently completing an iBSc in Neuroscience. In my research, I look at natural statistics of arm movements in congenital and acquired amputees. I believe that understanding the factors that influence the degree to which amputees use their impaired arm can help us in designing better rehabilitation strategies in the future. I am an MSc student in Psychology (Conversion course at BPP University). My background is in mathematics. I got interested in brain plasticity after reading Norman Doidge’s book about the Brain and took up an internship with the Plasticity Lab to gain more applied experience in the field. My research focus is on how changed hand behaviour (due to augmentation with a robotic finger) impacts hand motor control and body representation. My main research tools are the CyberGlove and functional MRI.